Remarks: This game was all about wood. We had four wood drops along the map, one of them SRNW. The network got separated into two as the goods trains had their own and wood trains as well. In the late stages of the game, we had also trouble with cash, as the inflation went strange. SRNW with a subnetwork was tested as well as a "tightly packed" station exit. Station exit compressing the trains together. 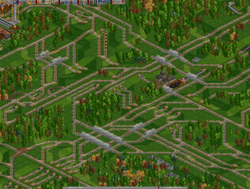 For normal people: Just rails everywhere :P.
Remarks: Quoting from Mark's plan itself, "Experimental pz-like plan", "Mainlines start off with LR, expand when needed". A twist to the PSG screenshots, a picture of the !! BUILDER'S BOARD, with nice eye-candy. A medium-sized BBH (09) created by Sietse. 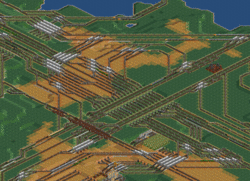 Notice how the tracks conform to the land, and terraforming is used very minimally. Remarks: A massive game has to include massive hubs, and it did. Gleeb's plan won over Chris Booth's and the building started, the LLLL_RRRR two way roundabout hub was the major part of the game, but it caused some jamming problems later in the game. The major cargo of the game was oil. One "Major Oil Pick up" produced a million litres a month. The SL had to be expanded to LL RR to fit the need of the growing number of trains. The game ended with 1,000 trains. 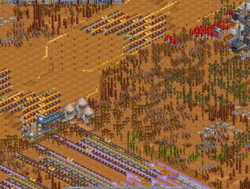 The Wood/Ore drops, and the Steel/Goods pickup, created by Chris Booth using a unique station which can be entered from both sides. Remarks: A return of the B2B (back-to-basics) gamestyle, with an unexpectedly good result. Remarks: A PAX game over a long stretch of map, connecting towns using the Japanese TrainSet. Remarks: An exciting mountainous game, led by insulfrog constructed over a period of 4-5 days made the map look covered head to toe, except for some small spaces containing no industries. The beauty of the plan was it's simplicity. BBH 01 by Mark, what one could consider the structure of the entire network. Remarks: It all started with a two-way SML ML loop with main stations on the corners and a single BBH on each edge. Over 1650 trains later, most of the farms had closed - wood, coal, and oil became the chief exports. Later in the game, balancing the loads on the sidelines became the challenge, as some sidelines were sparse while others were over capacity. Shifting some stations from one mainline to another helped alleviate a lot of the congestion. Remarks: Originally intended to be an RV-only game, the 2048 dimension made several players rethink that strategy. Instead, local RV networks were connected by a backbone rail line. 2000 cars and 600 trains carried cargo as fast as they could - which wasn't very fast (iron trucks carried 19 tons each at 80km/h). Don't drink and drive - you might get lost! 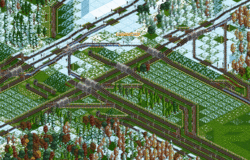 Remarks: An organic ML layout was chosen with mainlines that fitted nicely into the valleys and avoided the snowy peaks, which provided some pitoresque spots. 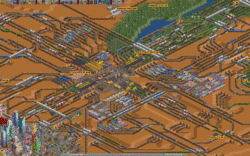 The initial connections required some extensive upgrading in the later game and also some mainlines had to be added, once this was done the network ran pretty smoothly. 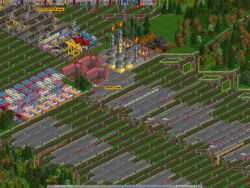 Remarks: Expert industries with stockpile limits were loaded for this game. We had a central ML with terminals connected directly to it. These terminals were connected to local rings which both produced and accepted cargo. ML trains were used to balance supply and demand over the rings. Remarks: Following the failed attempt of many plans, Chris Booth came to save the day. With inflation turned "on" for the first half of the game, running costs were high, so to survive, profits needed to be just as high. 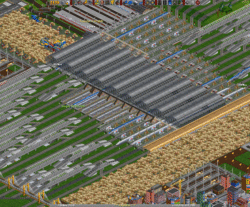 Remarks: Rather than going with the conventional load-unload orders we chose to have intelligent stations pulling trains of the ML for this game. Each of the 8 stations connected to the small or wide ML respectively pulled 1/4 or 1/8 trains off, making sure pax was distributed equally over the stations. Of course this resulted in some nice overly complex constructions. hacked in mainlines and jamming sidelines, all in the middle of the metropolis covering the entire map. Also have a look at Combuster's blog post about this game. 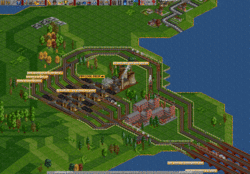 Remarks: Faced with a tough map, we started building quickly to get the main infrastructure down, from there it was adding industries and trains. And of course, removing/fixing jams. Remarks: The map was straightforward, flat and thus easy to build big constructions. Goal was to get a total population of > 2.5 Million with only 4 cities. Few succeeded and we almost went bankrupt while trying :). The main network was built with huge capacity which was never reached so no upgrades were needed. We ended up with a population of 1.1 Million, which is about half of the given goal. 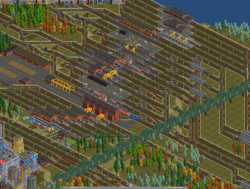 Remarks: The game featured a very mountaneous map, and together with the relatively high trainlength, this quickly became the main engineering problem. The plan nevertheless worked out quite nice, with only very little extension of the ML being necessary. 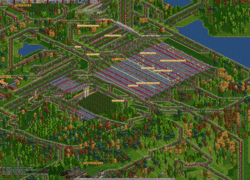 Huge mountain transfer station for goods and food. Because of CL6, it used up allot of space to connect to the ML. Remarks: The game started out with a very simple plan and structure. 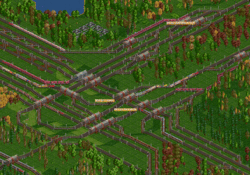 Most of the game was straight forward except for the rebuilding of all the hubs when we added the fourth and fifth main line. The factory drop/pickup was rebuilt several times, and multiple exit strategies were used. In the end we used an experimental merging technique which seemed to be able to cope with the large load of trains. 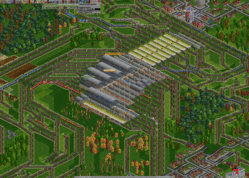 Huge Factory station which was rebuilt several times, the exit was rebuilt even more with various merging strategies. Remarks: A game stationed on a set of Japanese islands, which were quickly filled by tracks. The plan states that the big islands need one Shinkansen station each, with a local network filling it with passengers. In the end, except for a few nature reserves, all islands were covered by track, town, road or station. 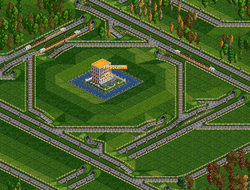 The game also saw some expertimal order usage, exploring the possibilities of conditional orders. Uetani local and Shinkansen station. Remarks: The goal of this game was to collect all cargo in Kent, UK, process it, and then send it to the port of Dover for export to the mainland. Planetmaker provided a plan with a cargo ring, and a dedicated goods path transporting the cargo from the industry in the west to the port in the east. The ring had to be expanded several times to cope with the many trains traversing it, ending up being 7 lanes. The final result sported a grand total of over 1100 trains and 150 other units. 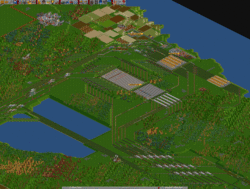 Remarks: This game was entirely SRNW with a goal set on producing 75K food at the drop. 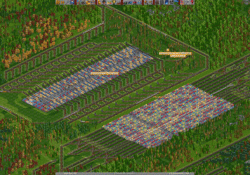 Three factories were needed and we got around 60K. 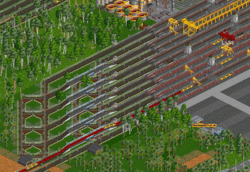 Some experimenting has been done to make more efficient, larger or just plain cooler looking stations. Remarks: A chaos type game with a mix between cargo and PAX. 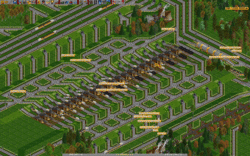 In the end ran over 700 trains on a maze of track. 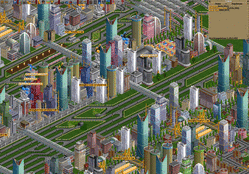 Since it was chaos most of the ghetto hubs that got build had to be rebuild numerous times to handle the higher traffic from later in the game. 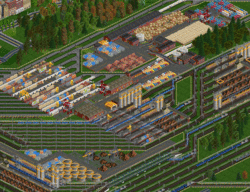 One of the major PAX terminals in the game. 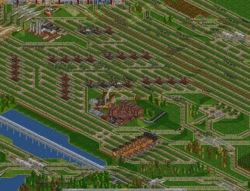 Remarks: The plan was a nice big X covering the map with a ring in the middle, and as an extra a maglev connection for passengers, mail and goods. The maglev tracks never reached their full capacity and were barely used. The rest of the system was too limited and had to be extended at some sidelines and on some places of the ML. What used to be a simple and clean SLH turned into a monster hub when all the livestock, grain and steel trains had to pass it. 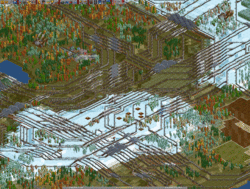 Remarks: The game featured an organic ML layout designed to follow the mountain ranges and coasts that made up this map. This plan featured an LLL_RRR central loop to which all main stations were connected. This resulted in some nice and big BBHs. After the primary industries began to produce some seious output traffic levels increased fast and and some places the mainline had to be extended to twice its original width. Remarks: After selecting a plan, construction began. Then construction continued. And some more construction. 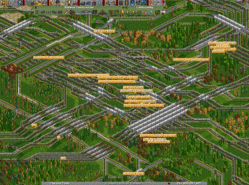 Practically everything in the game was reworked at least once, so it took time before trains starting moving. Several new players joined the server, so the late-game included lots of instruction and guidance. In the end, the network ran fairly smoothly, and most industries were connected. Remarks: Intended to be a proof of the Davil-style hub (blog article), this plan never really got off the ground. The loop was made too large, and later shrunk to a more manageable size. 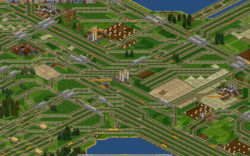 The Mainlines radiating from the loop were developed, but no industries (and consequently no trains) ever touched the network. In the end, the graphics proved to be too hard on the eyes and the game was scrapped in favor of a new climate. 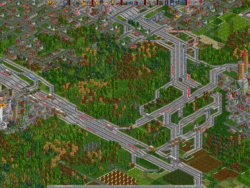 Remarks: The original plan involving many twoway loops and lots of massive BBHs, combined with different trainspeeds and trainlengths proved to be too hard. We decided to get rid of the inner loop and seperate the pax and cargo network, in the end the map came out pretty well. Showing an openttdcoop first: a full 5-way BBH. Remarks: The goal of the plan chosen was to have a high capacity network that worked with the map. We ended up with an LLLL_RRRR babcbone loop to which the other MLs were connected. BBH02 is one of the 6 big BBHs in this game. 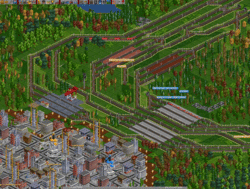 Remarks: This game featured a central hub station with an LL_RR leg to either side, trains picked up at both ends of the legs. After delivering their cargo trains were heading for the nearest depot to be refitted. This way train amount required was less then usual and trains mostly didn't travel empty. An oil pickup station initally used for the MM. Remarks: This game stated with 4 towns with 0 population. We had to generate city plans that included ICE lines and SBanh lines. 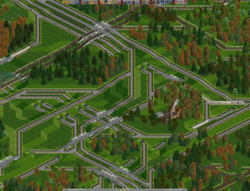 Mark's plan won which meant we had to and a clockwise outer ring with 4 one way central main lines. This means that each city had 4 ICE transfer station. 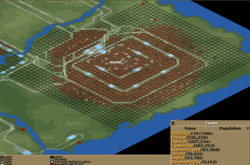 We had some very nice SBahn idea appear in this game and 2 very large cities, Marks city had 800,000 population peaking at arround 900,000 and Thijis had over 1,000,000 population in the end. 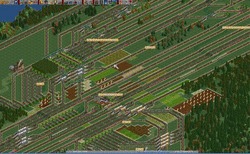 The game end with over 1400 trains. Remarks: 2 large rivers devided this map, the lead into the Nord and Oest Sea's, most plans seemed to focus arround deviding the map into 2 distinc areas. the final game we had to transport PAX and Cargo arround the map. Remarks: A stretched map with a full pax network. Around 230 ICE trains connect the 4 main terminals on the 4 main islands. The terminals are fed by local S-Bahn, trams and buses. From north to south straight through everything is the TL64 Beast maglev, making an almost impossible 15 million a year. Rindston, the biggest city in the game. 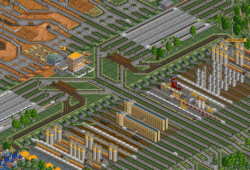 Remarks: An ambitious plan by RMJ, where all cargo is delivered to a single station in the middle of the map. The raws were picked up from two large primary wings. In the end the network held 800 trains in good flow. The huge main drop station. 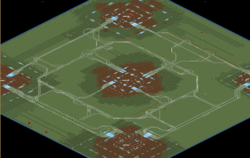 Remarks: A large map generated using the original generator and no newgrfs were used in this game to get the "oldskool" feeling. At about 1000 trains the outer ring of the network started to slow down and a 5th lane was added which kept the network running smoothly even with more than 1200 trains. This Picture shows the Iron and Goods Drop and the Steel Pickup. Remarks: Another ECS map, again with all vectors loaded. 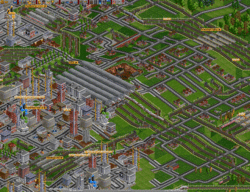 ECS combined with a chaos theory plan turned out surprisingly clean and all trains were moving smoothly in the end. 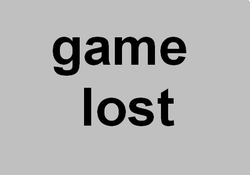 Due to an unfortunate saving accident (or lack thereof) we no longer have the savefile of this game. If you have a savefile of game 135, please let us know on IRC. Any save, no matter the progress ingame, would be of great help. Please return it to us. Remarks: Once again an ambitious plan, loading all the ECS vectors. Every vector was built seperately with its own plan, with freight being transfered between them on a huge circular mainline. In the end we managed to transport nearly all the cargos defined by ECS and running nearly a 1000 trains on the network. The ECS combined with the large map size sadly prevented players from joining in the end but all in all it was a good game and a decent introduction to the world of ECS. The Wood Vector Transfer, one of the busiest stations in the game, by narc and Chris Booth. Remarks: We picked a very ambitious plan for this map -- two parallel 4x4 mainlines with SML, with the drop/pickup stations at the loose ends of the mainlines. However, building the four BBHs took a very long time, and the plan also changed several times to remove some of the trickier requirements, such as "no mainline above the snowline", which was producing some very uneven mainlines that couldn't be properly connected with SLHs. In the end, some major rebuilds were required for the north-western stations to cope with the load. This game also tested the feasibility of using GRFs from BaNaNaS, which turned out not to prevent anyone from joining (though often they needed help finding them). BBH North-West, the first and most expansive BBH, but looking quite pretty. Remarks: The map was divided into 15 provinces, which players then assigned themselves to. A mainline was also built to shuttle the passengers around the provinces. Sadly, the map proved too big (so people didn't have much chance to cooperate in building their provinces), and a bug with the Japan Train Set made the game unplayable for most. Capital City's ICE terminal, featuring a sea of mail. Remarks: The map featured four separate cargo networks looping around in opposite directions: two for fruit/maize trains, a third for water trains, and a fourth for the massive (TL24) food trains. The most major problem with the plan was the difficulty people had in connecting everything up properly. The map's oddest feature, the so-called "compressors". The first one was built by Mark, the rest were added (and refined) over time. 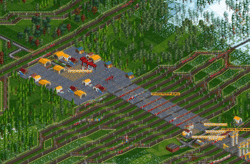 Remarks: Pretty standard cargo concept with TL 2 trains, which made for a lot of editing in various places, including a total rebuild of one of the major stations at one point. 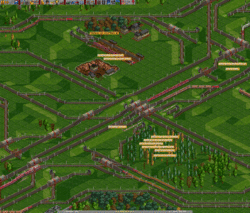 Showing the Wood + Oil Drop station, which got completely rebuilt halfway through the game, to cope with increased traffic. Remarks: The game was a pax-only game with feeder services bringing passengers to a few mainline hubs, which were then connected using point-to-point links. Remarks: We uses the Toyland2Mars conversion grf for this game. The map was devided in two, primary cargo from the south half was processed in the south and those from the north half in the north. The processed cargo was then transported to the other half of the map by maglev trains. The Northern main station and town, giving a good impression of the game. 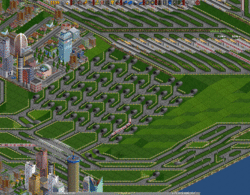 Remarks: The network in this game consisted of two separate networks, short (8 tiles) e-rail trains used one network while 16-tile long maglev trains distributed goods. 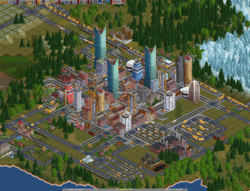 The plan chosen involved coop-style terraforming, though this didn't work out as intended which caused the game to be a bit in-active, also the Alpine climate newgrf caused strange clusters of industries at some places. Showing a nice SLH which is a good example of working with the terrain. Remarks: Chaos Theory got refurbished and applied in this game. 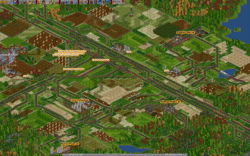 The map was divided into provinces with individual players building and managing the S-Bahn in their own place, with a global network connecting the main stations. Even though the network layout was left undefined, good cooperation resulted in a nice network with well over a thousand vehicles. 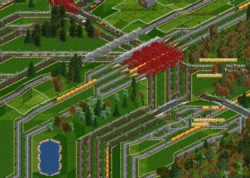 Highlight of this game is the invention of the C-Bahn, which proved extremely effective at transporting passengers within the town. Remarks: A scenario proposed by progman where all cargo should be brought to a city on a remote island. A plan was developed employing advanced techniques like SML and variable trainlengths. During the game the SML turned out to be very handy when parts of the ML needed upgraded from 3 lanes to 6 in some locations. Remarks: An old skool type game with Huge TF allowed, Short TL, maglev & 20 billion starting cash. No time was wasted and the network quickly came together. 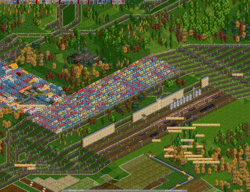 The game reached over 1700 trains before some people had trouble joining. Remarks: planetmaker provided a special christmas scenario for this game. The initial 4-lane wide ML soon started to show signs of stress and was extended to 6R_3L at places. No very advanced techniques this game but lots of fully-loaded mainlines and spectaculair hubs to admire. Remarks: The map featured two towns seperated by a rift "The Wall" in the middle which couldn't be tunneled or bridged. Goods and pax needed to be transported across as the cities needed to be grown to 100k population each. 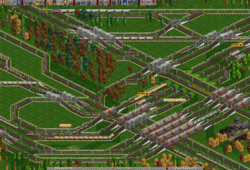 A SML-style network with two transfer stations at each side was developed. We ended with over a 1000 trains and 200 ships. In the end network capacity was reached and spurious jams started to show. Sheffield station serving over 500 trains. 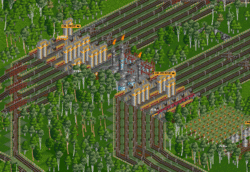 Using conditional orders allowed to pass by using full load and use this station as drop and pickup at the same time without having empty trains traveling around. 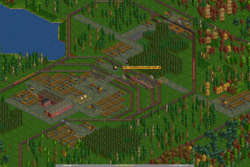 Remarks: The goal of was to transport enough grain and livestock to produce 100,000 crates of goods per month.. Later in the game we were limited by OTTD production limit of secondaries, which is roughly 2295 per industry tile per month. For factories, it means 27,540 crates of goods per month - so we had to build four factories and balance them well. We managed to accomplish our goal in 2177. The self-regulating game concept was very interesting, there were many clever ideas how to make the best (in means of effectivity, niceness, speed, ...) self-regulating loops and stations. See the blog entry for more information. Our central drop station with factories, at the point where we hit the 100k goal. The factories are fed by an amazing 21 fully-loaded Mainlines. 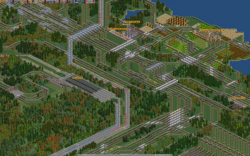 Remarks: The plan chosen was planned by our first female cooper, on this small map and was based on an LL_RR Mainline, which soon couldn't handle all the traffic and was converted to maglev and upgraded to LLLL_RRRR, running 600 trains smoothly. Remarks: A plan with several one-way circles was choosen. All back bone hubs were three-way, splitting traffic in two directions. 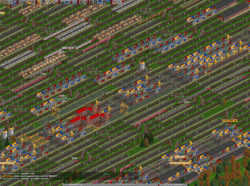 The game ended with over a 1000 trains and a staggering 500+ road vehicles without jams. Remarks: The map used in this plan was a custom scenario based around rebuilding the metro network for a large city which was destroyed during the Second World War. In this game we used a lot of selfregulating S-Bahns. Remarks: This game started with a revolutionary plan by Dihedral. 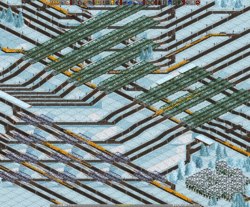 Later on in the game there was too much cargo to transport and it was too hard to add 2 or 3 lanes to all loops so we finished the game when we had 1000 trains. Note: This patch was capured by the timelapse patch. Remarks: A game with a lot of water and a lot of separate islands using Pikka's Basic Industries (PBI). 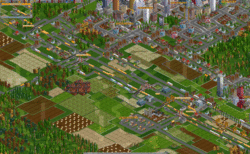 This game was plagued by the low production level of the industries, and the fact that the mines and wells kept closing. (This is a "feature" of PBI where mines and wells have a fixed amount of materials to produce, then "dry up".) The network that never really got busy, even at the end. This would have worked better with a shorter TL to generate more traffic, as well as smooth out the economy. Remarks: This was a TL2 game that was played for 20 days. In the end it ended up with more that 1500 trains and a 6 line CML, it has 4BBH's and intermediate SLHs at regual pacing. The game ended at about 85% completions, as we had a few minor jams left and not all industies were connected. Remarks: This game was over planed for. The planing stage took to long, and a plan the would have been suited for a map of 1024^2 rather than this small map emerged to win. the plan had a 5 way central hub, this was the only BBH. With train that had a max speed of 50MPH / 80Km/h and only 100 train the network didnt have any traffic problems. Remarks: This map featured much water and a plan which had a long ML where short ML branched to the secondary industries in regular intervals. 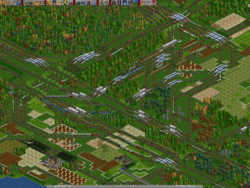 The result was finally a quite efficient network with many bridges which supported more than 900 trains. Remarks: This plan had a large cargo network delivering everything to a single large town drop. The goal of the plan was to grow the city to a population of 500,000. The coastal location of the city required heavy terraforming to achieve the goal. Remarks: This was a road vehicle-only game. We had over 1,300 road vehicles by the time the game ended. 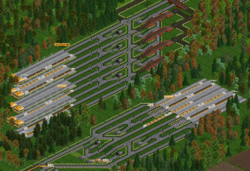 Several different station designs were used to see which type provided the best performance. 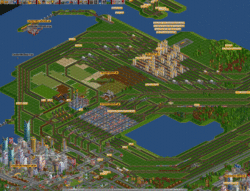 Remarks: This game featured a plan designed solely for huge capacity and effeciency. 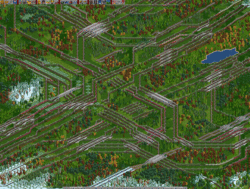 Two huge SML-Loops around the map could easily handle the almost 1500 trains we had at the end. SLH04 was one of the most congested places and often cause of jams. Thanks to the SML concept, joiner was pretty simple. There is a big transfer station with RV feeders. Remarks: This scenario (made by Mark) was a pax-only game with a network plan by DJNekkid and took a lot longer than it was expected to take. The network consisted out of one big line for TGV in the middle of the map and multiple, seperate feeder systems for the main stations. Remarks: It was decided to use the gametype "Back to Basics" in this game together with the 2cc-set, which resulted in a pretty messy, but working network. Game Date: 8.08.08 - ? Remarks: A 2TL monorail game with a seemengly simple plan. 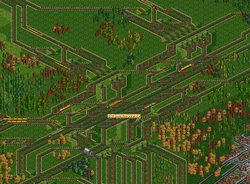 With over 800 trains on such a small map, many many early constructions had to be expanded as the game went on. This was the first public server game to start since YAPP was included in trunk. The Batmobile could be found roaming the map at times. The Coal & Iron drop station was expanded numerous times finally resulting in a 4 track entry, 27 platforms, 4 track exit. Remarks: An extensive plan made by tneo was chosen in this game. The network has a seperate line for goods and steel running North to South. Along the ML 6 Back Bone Hubs were created, which were extended heavily in the end. 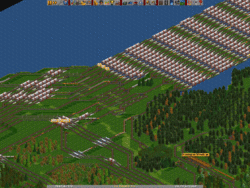 With 1324 trains the game ended running smooth. Those Back Bone Hubs are certainly worth a look while they are dazzling at times. An exit from one of the six Back Bone Hubs. Remarks: This game featured a custom map with big rivers dividing the map in 8 islands. People could choose as island they wanted to manage, which resulted in small, local networks on the islands connected with an interregional network. Shwoing a nicely optimized Back Bone Hub by Osai and Thraxian . Remarks: Marks winning plan was based around growing desert towns. To achieve this 2 concepts were used; Firstly the side line mergers used on the Drop ML, secondly the timer circuits used on the town ML to balance line load and delivery. This unorthodox plan cause a little confusion to begin with but as the game progressed the network ultimately took shape and performed rather well. 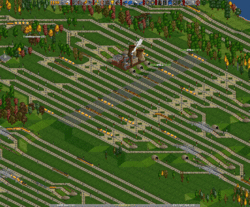 Over 1000 trains eventually serving the main station acting as both drop and pickup. 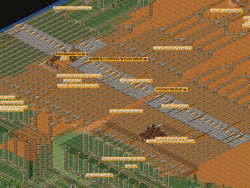 Remarks: Planetmaker had the winning plan for a game which involved the use of many different industies, as a result over 20 Major Stations had to be built with 8 BBH's. This took alot of time, and with the interuption of the wottdgd mid game the game was almost finished for a long time and only a few changes had to be made on the last day. Overall there were 750 trains, with no strain on the network, which is a good sign that the hubs network was produced to a high standard or not enough trains... How ever that point aside, Ottd Coopers managed to build a good solid network even through the confusion of having different (more Realistic) industries. Image Showing BBH 04, which was a brilliant piece of work, giving a good impression of the Fast flowing network, which stopped all jams. Remarks: Mark created the winning plan for a cargo game using erail and TL3. We had all the secondary stations in the corners, connected to the ML with 4 BBHs, and 4 SLHs for the primary industries. The network developed very well, except for one SLH, which was turned to chaos by people adding lots of bits to the original construction done by Mark. Remarks: The plan chosen involved the goal to connect all 104 (!) towns, this seemed like an impossible thing to achieve at first but we managed to connect all of them toward the end of the game. 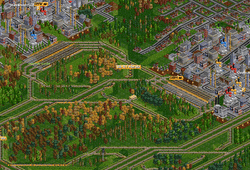 Lots of big cities, nice stations and clean building everywhere. Overall a very well developed game. 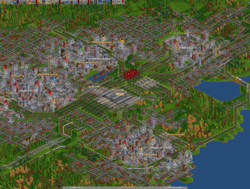 Showing a station nicely imbedded in cities, giving a pretty good impression of what this game looked like. Remarks: For the Public game #100 we decided to relive some old time, therefore we used the 3-year-old 0.4.5 version and various other "old-skool"-elements. In the beginning many people were not too happy with these settings but the game ended up as a nice, relatively clean, chaotic game. On to #200! Showing some nice, "oldskool" spaghetti. 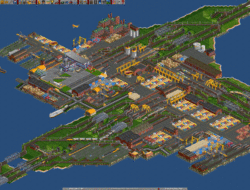 Remarks: This game revolved around one epically huge station in the center of the map, serving all cargo. From there, four RRR rings would go around the map serving the primary industries. A separate network connected a steel mill and oil refinery which were fed from the main station, as wel as a dedicated MagLev goods line. Building styles were varied a lot, in the sense that you could find both SML and classic hubs, RoRo and terminus stations, feeders and direct connections for oil rigs. 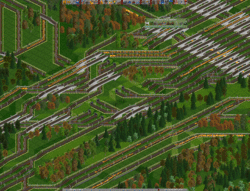 After careful optimisation, the game boasted a network running over a thousand trains smoothly. 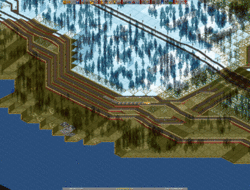 Screenshot of a part of the main central drop, with some great eye-cany by Combuster. Certainly worth a look in game. Remarks: This game developped into a nice, well-flowing SML-based network. 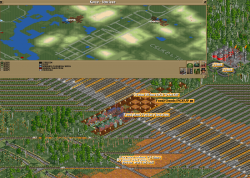 We had primary trains, running on two seperated SML-Networks with a drop at each end of the map and secondary steel and goods trains making complete loops between the two major stations. Showing one of many feeders stations, that were used to feed cargo to main drop stations. Remarks: In this game we had a very interesting ML Layout, we had a RRRR Diagonal ML Loop running across the map from the SW to the NE, this was a very interesting and Complex network planned by combuster, there was a low Terra rule although sometimes it was over looked, it did however make the mainlines look messy and there were many 'Ghetto' Style hubs, which didn't help matters and which eventually became a big problem with too many trains to handle, however there were fewer new players this game, and towards the end of the game the hubs became clearer and priorities were used more often and the network then moved better and the game became a success. One of the BBH's showing a neat optical bridge stacking effect. Remarks: In this game we started off with a plain map which had only 3 cities on it. 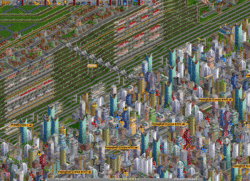 After the S-Bahns were built town growth was enabled and the cities started growing rapidly. 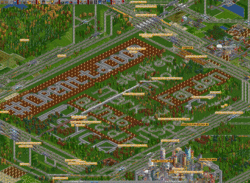 We ended up with a total population of more than 2 million and moving many millions of passengers each year. The shopping mall at Shanghai, situated between the two main traffic lines through the city. Remarks: In this game we had all trains going down a LLLL10RRRR ML. Included in the game were two refit area's, one at each end of the map. The goods/food trains refit from one to the other with every trip, and ran on a timetable. As a consequence we could reduce the amount of trains on the mainline, but maintain a high and smooth cargo delivery rate. 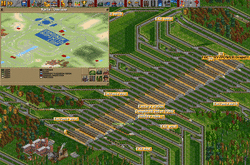 During the start of the game there was confusion regarding station design. All stations were meant to be terminus, but that was not clearly signed, creating lot of confusion when several stations needed to rebuilt to conform to the plan. The problems were eventually solved, and the network ended running very smooth. Showing a BBH that caused a lot of problems. In the upper right you can see one of the refit areas where empty food trains were refitted to pick up goods. 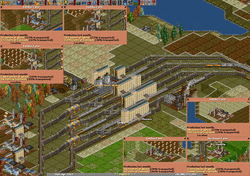 Remarks: In this game we had small feeders feeding the huge 20-Tile Mainline Trains. 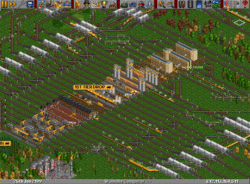 A misunderstanding in the beginning of the game, along with the unspecified engine to be used for the ML trains, lead to the ML being designed for a curve length of 4, and unable to handle the fastest engines. (The fastest engine would have taken about 8 engines to handle TL20, anyway, if not more.) The challenge of designing the stations for TL 20 was very difficult. Surges in traffic could easily overlaod the waiting space and block the ML. Showing one of the feeders. Remarks: A game making use of a new concept in which players got their own piece of map to manage locally. Later on the areas were connected with a Mainline network. 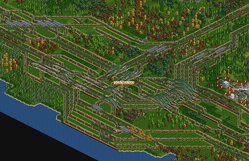 Remarks: The next three tiles train with a big LLL RRR ring around the whole map and a LL RR line in the middle. There were never bottlenecks anywhere on the whole network since the beginning. Therefore would the network handle more trains, but the maximum of 1000 trains has been reached. 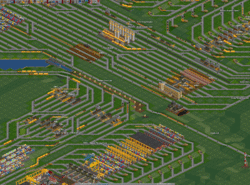 Combined factory and refinery station, serving over 750 trains, 550 of them delivering stuff. Remarks: This game was the result of the recent clamor for a Chaos game. 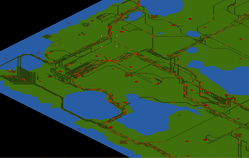 It was an "anything goes" with only two rules: Electric rail only, and minimal terraforming. The initial money maker line was kept and expanded to eventually use 5 entrance and exit lines, serving 19 coal stations. 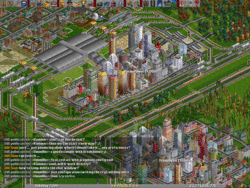 Items of note in this game include the Factory Island, Refinery Complex, and the three Oil Rig Passenger complexes. The factory Island. A great job of eye-candy, and very functional as well. Remarks: Due to the upcoming Olympic games pm and Kolbur came up with a plan to resamble the Olympic rings. Using Shift main line and in some spots the new concept of prios on TL they made a plan that had it all. Seven BBH's were created and other spots tracks crossed by bridge or tunnels. 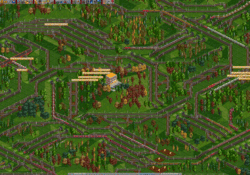 We ended the game with a flow of a 1000 trains. Main drop station area of the Olympic Rings. Remarks: A mountaines and watery map, that had two islands in the northern part of the map. By using air transport we provided a service to the mainland to carry on the passengers there of. 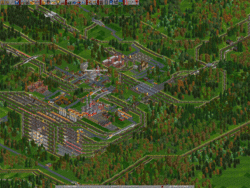 The main goal in this game was all about eye-candy, so a variety of locs was used and tracks layed nicely around mountains and towns, with very low terraforming in mind. Showing a location of nicely working with the terrain. Massive RRRR_LLLL backbone hub built by Kolbur. Remarks: A standard Cargo setup with a passenger transport between two cities with S-Bahns and populations of about 100.000. The Norwegian Trainset was used, the Mainline started with two tracks each direction and was at some parts extended to 3 or even 4 tracks. The City of Tuomela and the surrounding assimilated Cities. You can see how it grew around the various stations, like the Paper Mill Pickup. 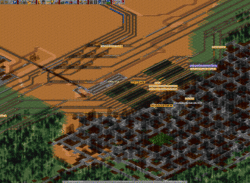 Remarks: A special map w/o any industry except some coal for the MM was used and seven 0 population cities which only grow after removal of some road(s) - but then at very high speed. Huge local s-bahns transferred to the ICE terminals which connected to a ML grid. The biggest towns grew to over half a million probably beating the overall record for the transported PAX. 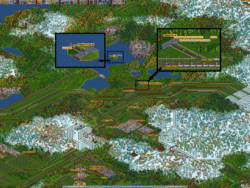 ICE terminal and part of Mark's and Den's huge city with more than 585.000 inhabitants. Remarks: A game with some difficulties in there. It had a different setting for signalling and used LRRL which made it confusing at times. Also the low terraform ruling proved to be challenging for some. It turned out to be a very short game, due to the high amount of (new) active players. 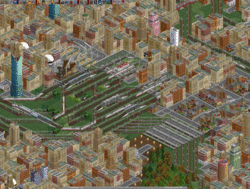 A dense developed city area with the central station. Remarks: A game making use of the SML concept on maglev tracks. The plan chosen had to drop/ pickup station on the West and East side. Initially we started with 3 ML's and ended up with 6 or more at some points. The game proved hard to get a clean network after the initial start up, but it was a nice game overall. Showing one of the shifters used in the game to balance traffice over all lanes. 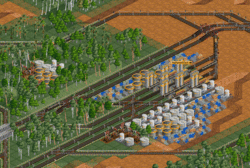 Huge oil drop station designed by tneo, built by many. Remarks: This game started out with a chaos-style cargo network, and a separate maglev pax net, with just one condition: all cities connected to a central backbone. Later the cargo part was fixed up to a more regular type, with a separate outer maglev ring for goods. Remarks: The plan chosen asked to use the canal trick that Osai explained on the blog. Connected to this Mainline were four different transfer stations, that each was serviced with a dedicated network for that station. In the North and South drop-off areas were created where all raw materials are transported to. Logic in this was the transfer stations would send the cargo to the furthest drop. Showing one of the transfer stations. Remarks: This game will be continued later on, due to an error. Remarks: The map used was a format never before done, the rectangle shape made it extra challenging to get a nice network in it. 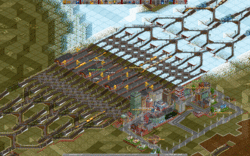 Using SML made it fairly easy to get all industries connected without jams. Overview of the stretched out map. 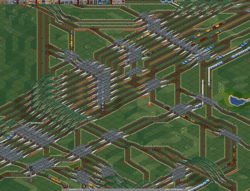 Remarks: This game started with a messy chaos network, but in the end we succeeded to squeeze in 600 trains in a pretty flowing network. The company name was picked due to lots of desyncs during game play. 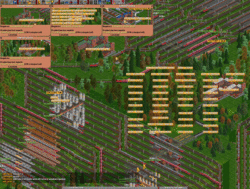 A hub containing all rail types that were used in the game. 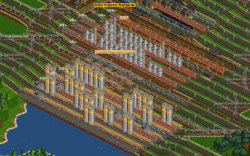 Remarks: A seperate goods track was made around the entire map, containing trains with a TL of 50! Showing TL50 train entering station. A nicely by MDGrein eyecandied goods pickup station. A nice SLH created by Penknight and heavily changed by SmatZ. The restriction of Terraforming made it look like this. Only minimal changes were done. 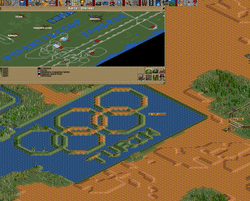 Screenshot shows working with the terrain. Remarks: This game combines a Shinkansen Passenger Network and a Cargo Network with Japanese flavor and grfs. The screenshot shows how Shinkansen- and Cargo Network are built close to each other. Remarks: A pretty crowded game due to the Tilelength of 2 and the very small map. 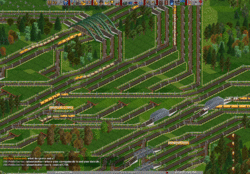 We had to completly rebuild the ML because the ML could not handle the amount of trains. Remarks: Unfortunataly, this map was a bit small for the network design we chose. The network was quite good IMO, but was really suited for a map bigger then what we had. Also, the layout of the map was not very good, with only two towns lying in the north-east part of the map, effectivly making anything we built there useless. The NE Terminal with transfer station. Remarks: We pushed this network to the limits. 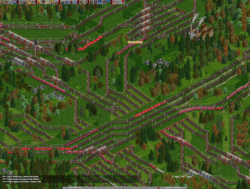 There was a huge MSLH in the middle of the map but it never got used to its full potential because the rest of the network could not cope with that many trains. The MSLH sitting in the middle of the map. One of the Backbone Hubs of the inner circle. The central Food Proccessing plant, producing ~30.000 units of food every month. Remarks: Chosen Dual SML plan set the limits pretty high and with standard 500 trains network was hardly even used. Following necesary move to more powerfull server (thanks to Ammler for hosting) some parts of the network shown signs of stress after reaching 1500 trains mark. Overall very well developed game, some things still left to conenct but average PC can barely play this with reasonable speed already. 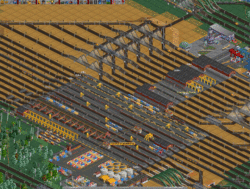 North west corner of the map, factory drop (a bit left from the center) serviced by more than 500 trains. Goods pickup on far left visited by ~200 trains, making £600,000 per trip. Most of trains are spending 80% of their time moving from and to stations. Remarks: This Game was a Challenge right from the start. 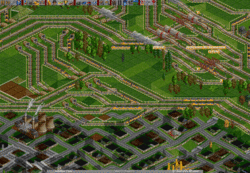 Players choosing a unusal network plan, this game had many puzzeling elements to the game running a west and east network supplying each other with the raw goods, multiple train lengths. this network was a challenge. The Main West Station Loading Raw Materials From The East. 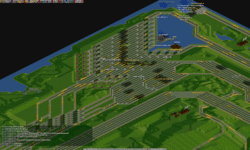 Remarks: WARNING: Savegame very likely corrupted and will crash OpenTTD. Pause immediately and you may be able to look around. 3 islands. 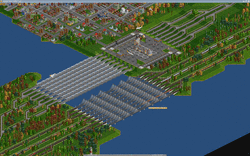 Neatly joined up, having many bridges did cause some congestion and queue's which slowed trains to a halt. Remarks: Breakdowns were enabled. Early on, the ML became a parking lot for broken down trains. Later, redundant lines were added to compensate. Players were harder to find, as this nightly build generated desync errors early and often. 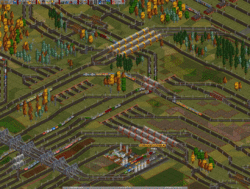 Remarks: This game featured a 3x3 SML mainline loop and dual-RoRo stations (as shown on the right). The sidelines originally connected opposite sides of the main loop, but were severed to discourage shortcuts. Towards the end, a flooded lake became home to a Dubai-esque settlement. Remarks: Road vehicle only game. Remarks: In this game we made two separate lines. The first was bringing cargo to one station which was connected to a sawmill, a factory and an oil refinery. The second line was transporting goods from the industries to a town. Remarks: One network, 4 BBHs, lots of junctions. 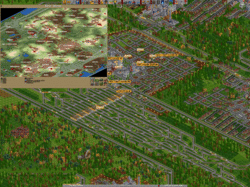 SML and 1610 trains, not CPU friendly, but amazing network capacity. Remarks: The Idea: a plain map, five cities, create a local/express traffic network and grow the towns as big as possible. We stopped the game after reaching 1,700,000 citizens because it would have taken too long to grow the cities so big to cover the whole map. Anyway the game is continued as an RBC-Game. The town area of Hanford is really nice. 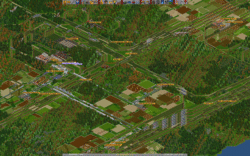 Two Terminus Station's for Passengers and a Mainline straight through the City. Game Date: 16.06.07 - ?? Remarks: A large Game with 8 Tile trains, got some new people playing but game went fine. Could use much more improvement. 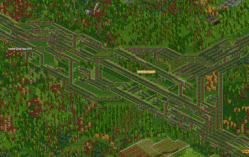 We didn't reach 500 Trains on the map. While the northern mainline is full of trains, the southern ones are empty. BBH 02, the most heavily-used backbone hub. Remarks: In this game we had TTT and transported Pax to two big Central Stations. We didn't build any SBahn. Instead we transported Pax from telescope stations in all Cities directly to the major ones. In the middle hylje built a big BBH which isn't truly four-way but like looks like this: <:> (no need for: #). Remarks: A nice game which made use of the new Shift_Mainlines (SML) and some big station areas at the north and south ends of the map. 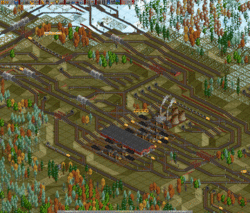 Unluckily you need a very huge amount of trains to bring our game concept in trouble on a three-track mainline. 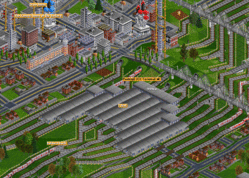 Remarks: This game is quite similar to PSG#42, but now we used the great new feature of trams in OpenTTD. Basically we missed the aim to cover the whole map with city area, but anyway this is an awesome game. 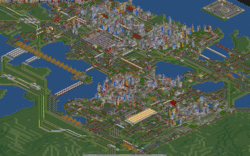 Largest city in game, was grown by S_m_w mostly and had several re-do's on station and S-bahn rings... However we still failed to move passengers fast enough. 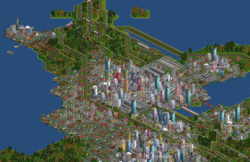 Senwood with 100,000 inhabitants. 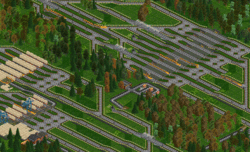 The city was mainly developed by de_ghost. 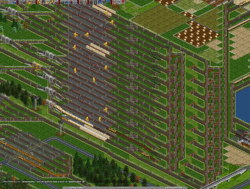 In the north-east you can see the MainStation transporting ~10k pax per month. Remarks: This was the first game with the MarsSet (a toyland replacement grf). It shows the variety and complexity of the openttdcoop newgrf-package. A lot of people don't like the toyland grfs and neither the marsland ones. But I think it was quite funny to play such a scenario. A nice concept for a SLH by Doke. Remarks: The game was very slow at start due to unorthodox and complex mainline design. Eventualy most structure was in place, and we learne that server capacity is much lower than network can handle. 500 trains were handled moving quite fast with no major issues. Osai has started quest for alternative server to continue the game, and thanks to Alanin we got one! 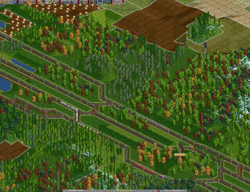 Game has grown nearly to 1000 trains (however network capacity was closer to 850, past that amout of trains hiccups bacame quite often). One of farm group terminals, producing about 7500 units of combined cargo per month served by more tha 80 trains. Remarks: We used long trains, to prevent the 500 trains limit. In the outskirts, many cities were grown:) This game was a big one, but unfortunetly has got jamming problems. See this blog post for details. The Oil dropoff, Wood dropoff and Goods pickup area. It was so huge, this game was massive. Remarks: The trains are very long. 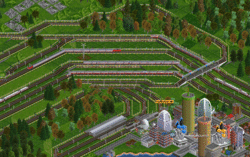 The network idea was to have express-sideline and local-tracks. But somehow those local tracks were not as successful as proposed. There were no balancing and prios between SL and local, what means in fact no network optimisation. 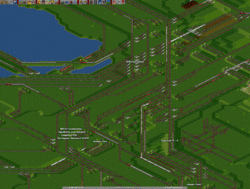 A station overview for way too looooooong trains. Remarks: A nice network idea. Two main cities we served with all the things to grow. Later on we transported also there Passengers and Mail. A lot of new players joined openttdcoop while running this game. 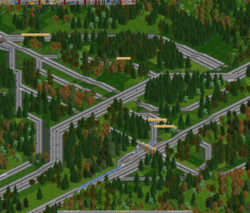 It shows how fast you can learn to build proper junctions. 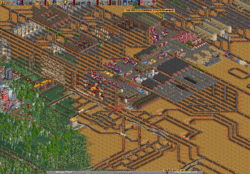 One of the main stations, its eye-candy with those dead-tracks included into the look and feel. Luckily, the BBH became a lot clearer once we switched one track to maglev. Remarks: The first TTT-Game (TwoTileTrains) since ages. This is a hard competition, the number of trains would be unlimited and only the sky is the limit. In our case the network-capacity stays the limit. All in all 744 trains and the oil/wooddrop was served by 205! 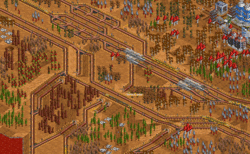 trains. 1680x1050 pixels full of tracks, we do _not_ need to comment that, do we? Remarks: The first game with newhouses! Yay! Long Distance station on the left, Regional in the middle and small 2 platform S-Bahn on the right. Remarks: A short but completed game with the Toyland set. Please Note: we do not feel responsible for any brain damaged caused by ingame graphics. Remarks: The game was silly. Remarks: * Xer has wrote a storyline for this game. Remarks: * Alpine is broken: we couldnt build all secondary industries as intended. As long as possible trips. Maximum profit. Flow was important in this game. xeryustc: are you guys maing seperate networks for all industry types or something? this is our masterpiece. no, its really our moneymaker drop. Remarks: Majorly islandy map, so we could not plan as we have in the past. This is why you do not build your stations this close to ML. The first hub in this game. ICE trains and cargo trains together on the LBR mainline. This page was last modified on 22 October 2009, at 14:05.